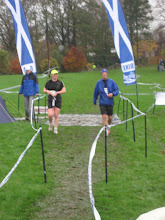 ....is going to be the Troon 10k on 6th May. This means I have 8 weeks to prepare. I have not put on a pair of trainers since my last race (get me sounding like a runner!) due to working away with work last week and putting in silly hours. Now, I could have gone when I returned from my travels but my boiler decided to go in a huff with me for being away and packed in. This meant I returned to a cold flat and unable to run a hot bath. Of course I responded to this problem in a very mature and independent womanly fashion - I called my better half Mark (Coach DQ) and blubbed. Mark immediately put on his shoes and drove to Edinburgh to rescue me despite it being late at night and work the next day. He truly is a star!! Great to see you and DQ on Saturday night. Thanks for the bottle of 14.5% Vino Collapso (hic!). Holyrood Park is a great place to run.....take that path off to the right by the little Loch with the swans. It takes you right to the top of Arthur's Seat. Not so many runners up there!! No, not "those shorts with those legs..."; the bit about "fit, toned, handsome" .... oh ...right! Never mind, you'll love Troon. It's flat, scenic, and only one wee hill that won't be a bother if you take your time..... not like I did last year when I thought "It's just a bump, I'll get past this annoying Bellahouston Harrier" ... and blew a gasket. Pity I won't be there, I'll be in Portugal... warm weather training of course!